It’s very common to experience tension and different types of muscular pain with migraines and headaches of all kinds. But Cervico occipital neuralgia is another beast altogether. These pulsating, stabbing, shooting or lightning like pains can be anywhere from a mild disturbance to an incapacitating and crippling pain. In this article, we will talk about cervico occipital neuralgia and 9 easy remedies for pain. What is cervico occipital neuralgia? Cervico occipital neuralgia is a condition in which the occipital nerves which run from the top of the spine up the back of the head get triggered. When they are triggered they can create pain which can present in a number of different ways but is most often intense and sharp. Cervico occipital neuralgia is very commonly confused with tension headaches and migraines but there are differences and proper diagnosis is important for the right drugs. That said, when we really want to understand why our body is triggering these pains, the diagnosis may not be as important because they are often just a label put on symptoms and don’t give us any value in understanding the etiology and cause. Some of the most common causes of this condition are when the nerves get pinched, trapped or damaged, triggering pain sensations throughout the entire nerve. The key difference that separates cervico occipital neuralgia from other types of headaches is that on physical examination if someone presses up against the nerve it is usually painful. As with most conditions we have to make sure we address the deeper underlying causes to our dysfunction otherwise we run the risk of continuing superficial therapies for life and spending thousands of dollars and hours on just palliation. This is not medical advice and is only for informational purposes so seeing your doctor should always be the first place to go to make sure there isn’t something more serious going on. Our neck needs balance to be able to function properly and take any pressure off our nerves. In a normal, balanced and functional individual there is harmony between front and back neck muscles but the more and more our culture leans forward with their heads, the more common neck dysfunction becomes. The advent of electronics has increased the speed at which we hump over and lose our postural integrity so it is always important to correct posture as one of the first areas to go and it is often helpful to see people like an alexander, feldenkrais or eldoa practitioner. What often ends up happening is that because we lean forward so much, the muscles on the back of our head and neck get increasingly tight, to hold our heads on our bodies. And inversely, the muscles on the front of our neck get weak because they are never used. This causes them to not be able to keep our head up and back. 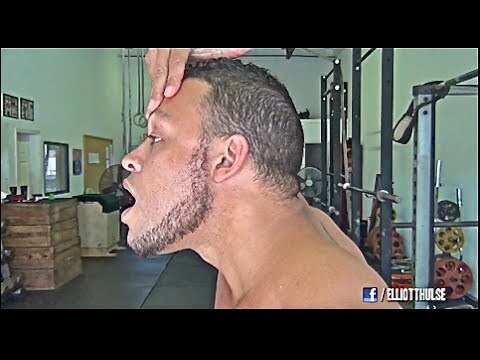 The simplest place to go from here is stretching the muscles on the back of the neck and head to release any tension they have and then using exercises to strengthen the muscles on the front of the neck. See this video to get an idea of the simple exercises you can use with your health-care provider. Whenever we are dealing with a chronic pain we need to look for inflammation. Inflammation is the sister of pain and when inflammation is present it causes the body and nerves to become aggravated, often triggering pain. Healthy inflammation is acute, comes for a short while until the problem is solved and then leaves. But unhealthy inflammation is chronic and signals that the issue is still there or the body does not have the resources to deal with the problem effectively. Long term inflammation means we need to take action and add support. One of the all stars in the inflammatory game and especially in the headache arena is turmeric. Turmeric is an amazing herb used for thousands of years because of it color, flavor and benefits. But it can also be used therapeutically for inflammation in the right doses. See our article on turmeric curcumin for migraines and headaches here. Stress is a leading killer and should never be underestimated. Especially when it stems from issues in our childhood. Patterns of stress from our childhood can create an almost permanent epigenetic expression of fight or flight system activation in our bodies. This means our body will always be wound up, tense and not healing properly. This is a recipe for inflammation and chronic pain. When we are healthy and happy, we have a much easier time staying up right, breathing properly and avoiding any infections. But when stress creeps in, it lets all of the other non optimized systems in our body loosen up and provides holes for problems in our life to leak in. Do you feel overwhelmed or stressed? Do you feel like you have to be doing things and productive 7 days a week? Are there unresolved emotions that you can’t fully get out but you find creep into your life whenever you’re not distracted? These are all possible signs you need to significantly lighten your load and do some emotional releasing therapies. There are some very common patterns that contribute to excessive strain on your neck and head. They are fed by a dysfunctional core. The body is interconnected, like a web so that if anything happens in one part, it affects and is felt in others. Our neck and head take the burden because our body prioritizes senses like seeing and chewing over others. This shift can put unnecessary strain on our vertebrae and lead to trapped nerves, creating pain. Take a picture of your profile or get someone to assess your posture and see if and how you are compensating. If you don’t know, then you won’t even know you need support in this area as it can often go on and build over years. Read our article on 1 big tip for cervicogenic headaches to understand the biggest cause of poor posture, creator of poor posture and contributor to strong posture and health here. Inflammation is synonymous with heat, redness and swelling. The body is showing there is too much heat here, it is bringing more blood flow to the area to resolve the issue and filling it will water creating swelling to cool it down and take away waste. Increasing water intake is essential to supporting the hydration of our vertebral sponges and the flushing of lymphatic fluid. Give them what they need. Our lymphatic system is the waste management system of our bodies and is filtered out through our kidneys, constantly requiring clean fresh and pure water to do its job properly. You can also physically “cool it down” and it’s very common to do so with ice packs. Even more effective is a cold shower and using alternating cold and hot. This is a great way to increase circulation and resources to the area for free and without taking time out of your day. 20 seconds at a time, alternate hot and cold for 10 repetitions each or until you feel pulsing in your body or relief. Surgery is a major decision and we should try whatever else we can before we go to these ends and this is where homeopathy may provide some solutions for us. Taking homeopathic medicine shouldn’t be done long term unless under the supervision of a homeopath or naturopath. Post isometric stretching is how we should all be doing stretches. It ensures that all of our muscle fibers, tendons and ligaments are engaged before we put the stress of stretching on them so that we get a more even and therapeutic stretch. Post isometric stretching simply means a stretch after a flex. So whatever muscle it is we want to stretch, we need to flex and contract it, ideally as hard as we can first, before letting go and loosening it. One of the first reflexes when we get the pain and tension in our necks is to stretch it, but this is minor if at all effective. Really, we want to go into a strong flex and then release into the stretch, holding for a few seconds, longer if we are trying to take the kinetic tension out of the muscle completely. If we need to use our neck, its better to use shorter stretches, if we are getting ready for bed then a longer one may work better. Nerves are always trying to repair themselves and function properly. Sometimes we can get into an accident or have a viral infection that attacks and damages our nerves. In these cases, the more we can fire the pathways of the nerves and provide the nutrients they need to repair, the better our chances. Our entire head has muscles and fascia and we can flex it, forcing our body to create new connections through the neurons in the nerves. But we also need to provide the proper nutrients. The basis of this is good healthy fats, sufficient amino acids and nutrients for the building blocks. To support this we want to avoid all hydrogenated and spoiled fats like vegetable oil, canola oil and rancid fats like old fish oils. But making sure we get enough omega 3s in the forms of EPA and DHA is paramount. We need lots of them and the best sources come from fish, ideally wild caught as farmed fish are not raised well and fats have a tendency to hold onto poisons. Nuts and seeds also provide a great supplement as well as healthier oils like olive oil and coconut. Amino acids are crucial and getting enough of them is easy. But getting them in the right proportions means we need complete sources of protein (like those found in meat) and the digestive capacity to break proteins down into amino acids. Nutrients are found all throughout the two areas above but we also want to set a foundation of 9 cups of vegetables a day. Following this simple formula is a great way to begin nutritional support for your nerves. Gout, diabetes and arthritis are massive problems for out entire body and need to be dealt with by an experienced holistic or functional health practitioner. If your health-care provider has only recommended drugs for these conditions, fire them and find someone more educated in the many daily things you can do to ease off the stress on your body. These are complex diseases so any one or two things I would list here would not be doing them justice but they are primary sources that need to be addressed and supported first. At the very least, they need to be stabilized or we will continue experiencing nerve damage and problems running rampant and out of control. As we add more resilience to the system and take off the burden caused by the many different areas that can be compromising our spinal and nerve health we may see how amazing the healing systems in our body actually are. To get a deeper understanding of how our most vital system, breathing is, read our article on 1 big tip for cervicogenic headaches here. If you want to learn more than you ever have before about migraines and headaches because you want to benefit from the information then join the Migraine Professional community here. Do you experience cervico occipital neuralgia or know someone who does? Share this article with someone who may benefit by using the buttons below.